The Coen Brothers' latest black comedy, A Serious Man, is their best film since The Big Lebowski (1998). Like that film, it will face some adversity in reaching its audience since it is a little "inside sports" when it comes to Judaic religious rituals. But it should appeal to anyone with an open mind, a wicked sense of humor, and a love for the Coens' brand of hilarity. to leave him for the patronizing Sy Abelman (Fred Melamed), a widower whose late wife "isn't even cold yet." His son steals money from his sister because he still owes his dealer for the lid of pot he bought a few weeks ago, which he shares with his friends as he prepares for his Bar Mitzvah. His daughter is stealing Larry's money to save up for a nose job. His brother, Arthur (Richard Kind), a socially awkward math savant, is unemployed; sleeps on Larry's sofa; monopolizes the bathroom every night to drain his sebaceous cyst; and somehow manages to sneak out for card games, where he cleans out his opponents using a form of mathematical probability prediction he invented called Mentaculous. And these are only the beginning of the problems he will face. Those familiar with the Bible will recognize the Old Testament fable that influenced A Serious Man. As they have done in the past—with Lebowski, a California slacker update of Raymond Chandler's detective novels or their fresh take on Homer's The Odyssey in O Brother, Where Art Thou? (2000)—it is clear that the Coens have looked to a literary source, in this case the Book of Job, as an inspiration for this film. Look no further than the three Rabbis he seeks advice from—stand-ins for Job's three friends, Eliphaz the Temanite, Bildad the Shuhite, and Zophar the Naamathite—as proof of the film's origins. But unlike those Biblical characters, the three rabbis don't offer Larry any solace. And Larry probably doesn't have the fortitude to withstand the obstacles God lays in his path. The film pokes fun at Judaic cultural traditions, its (to outsider's eyes) weird contradictions, and its underlying Old Testament version of optimism... which many would just call pessimism. But it is done tenderly and amusingly by the Coens, masters of bleak comedy, who for the first time may be letting a little of their own background inform the events of the film. A Serious Man offers many laughs as we follow Larry through his travails. And though it will face some trouble reaching an audience (how do you effectively market this movie to middle America), once they see it, they will be able to enjoy the film as much as anyone else, as the diverse group of Atlanta viewers I saw it with last night proved. We all laughed pretty heartily throughout. 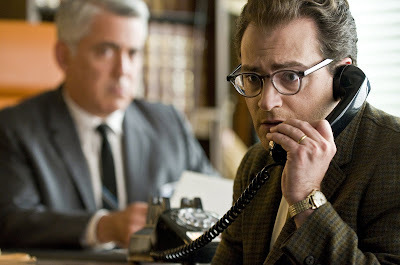 A Serious Man is in limited release and should open in more theaters this weekend. My favorite movie of the year. Only Malick's Tree of Life has a chance of topping it. Or maybe Hillcoat's The Road. I think I still have to side with No Country For Old Men, which is either my pick for film of the decade or second to Yi Yi, but this film made it hopelessly hard to pick a favorite. It takes Barton Fink, removes the overt surrealism, and fills the cracks with their most Flannery O'Connor-esque comedy to date. I love how it deconstructs the notions of Judaism and Jewish humor so that it can rebuild them as a grotesque whole, wherein God is the greatest and most savage Jewish comedian of them all (when the cliffhanger came, I just imagined a comedian saying "and then things got bad.") I'm crossing my fingers for The Road, but at this point I'm skeptical that anything can knock this, The Hurt Locker or Inglourious Baserds out of my top three.